Prequel to upcoming Book Three of the Milford-Haven Saga. Miranda loves her new hometown Milford-Haven, set along the undiscovered beauty of California’s Central Coast. And she also enjoys the sumptuous city of Santa Barbara, just two hours down the coastline. Hired by Katy Sails of Sea Otter Rescue to paint an outdoor-mural, and hired by her own artist’s rep Zelda McIntyre to paint an indoor-mural, Miranda packs her camera and painting supplies and heads south. Her first kayaking adventure to visit sea otters in their native habitat is sheer delight, as she and her otter-rescuer-host ply the kelp forests and carefully observe the otters caring for their young. But unbeknownst to them, a human predator is sliding sleathily through those same waters. 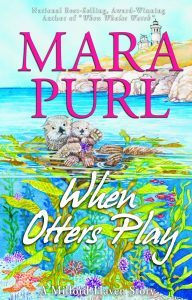 Meanwhile a second adventure takes Miranda—along with crew and tourists—to the mystical island of Anacapa, where, under the watchful eye of a professional diver, she swims with the otters until a near disaster threatens the life of a precious otter pup! Though the e-book stands alone, it also introduces Book 3 of the Milford-Haven Novels, the critically acclaimed, popular series, a multi-generational saga. Based on Purl’s BBC Radio drama Milford-Haven U.S.A.
Don’t miss the story before the story . . . the short story that happens right before Book Three, Why Hearts Keep Secrets.